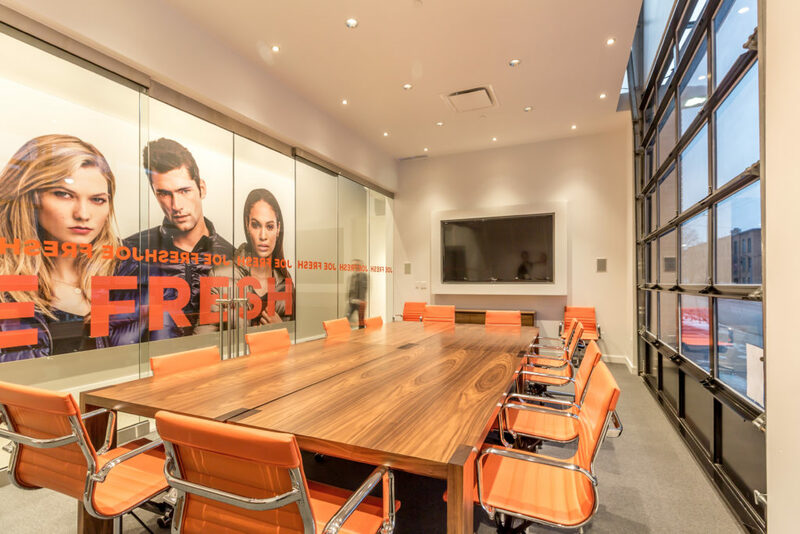 Turner Fleischer was selected to renovate and expand the design studio, showroom and mezzanine of the corporate offices of Joe Fresh, a fashion forward brand based in Toronto. The objective of this renovation was to expand the existing studio into an adjacent building and refresh the entire space. Turner Fleischer started the process by having the two buildings laser scanned and modelled in REVIT to identify sections and elevation changes. This ultimately allowed the team to be able to design a dynamic and practical solution to the challenges the existing buildings presented. The laser scans revealed that the floor in the proposed space was uneven and a large portion stood much higher than in the current studio. Excavating would have been time consuming and cost prohibitive, so it was agreed that a new floor would be poured with ramps joining new and old spaces. This exercise revealed opportunities to space-plan the studio and incorporate circulation ramps at the very early stages of design. The client wanted a cohesive look between the new and existing office spaces, sparking innovative solutions from Turner Fleischer’s Interior Design Department. Existing walls were painted white, while the partition wall between the two buildings was left unfinished and exposed, signifying growth. All wood columns and ceilings were kept natural and untreated to further distinguish between old and new. 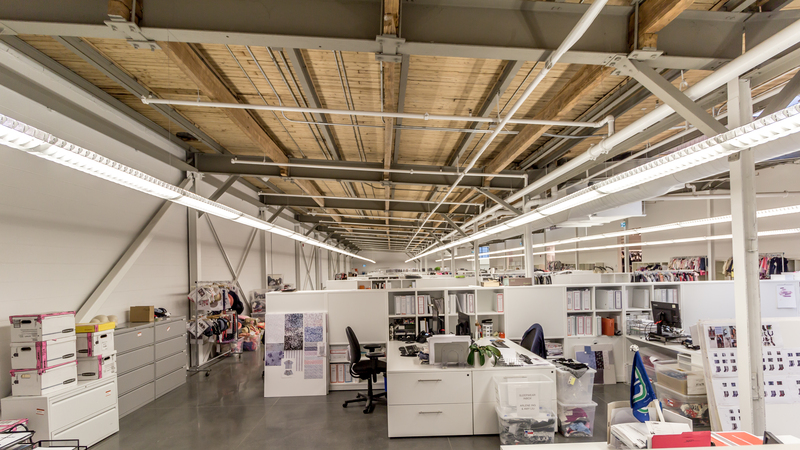 A testament to Turner Fleischer’s process and planning, the office remained operational throughout the entire renovation process. This necessitated the project to be completed in phases. In phase one the new building was restored to a useable state, a new floating slab was poured over the existing floor, old skylights were re-introduced, and loading docks were filled. In phase two, employees were temporarily relocated to the new building while the existing office was renovated. The result is a stunning example of a modern work environment, with many testaments to the heritage of the site.